IN TERMS OF LENGTH and volume, the Ruhr River is not one of GERMANY’s major rivers. But considered as a center of economic activity, the Ruhr is among the most prominent rivers in Europe. Starting in the early 19th century, the coal that was mined in this region was processed in factories all along the river’s course, creating one of the world’s largest industrial centers, notably for steel production, until coal ceased to be a dominant energy source in the second half of the 20th century. The Ruhr Basin covers roughly 1,200 square mi (3,000 square km), from Arnsberg in the east to the river’s confluence with the RHINE at Hamborn and Duisberg, overlying one of the largest coal deposits in the world. 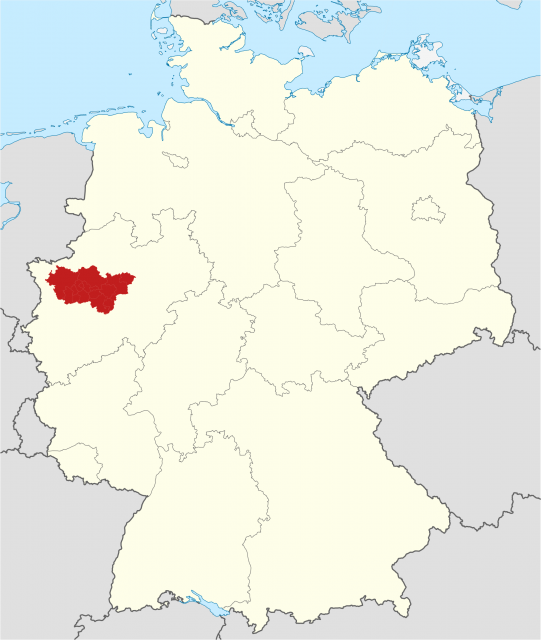 Today, the Ruhr area, or Ruhrgebeit (Ruhrpott in local slang), forms the largest conurbation in the state of Northrhine-Westphalia, consisting of ten major cities: Duisberg, Oberhausen, Bottrop, Mülheim, Essen, Gelsenkirchen, Bochum, Herne, Hagen, and Dortmund. Altogether, these cities contain about nine million people, the third-largest urban area in Europe. It is Germany’s most densely populated region, stretching from the Lippe River in the north to the hills of the Bergisches Land to the south, and from the city of Hamm in the east to the Rhine River in the west. The river itself begins in the uplands of the Sauerland, near Winterberg, and flows about 100 mi (160 km) to the Rhine. Formerly an area of small villages and pastures, far from the political and urban centers of Germany, the Industrial Revolution brought enormous changes to the area and large cities grew up nearly overnight. The area was a principal target for Allied troops in both world wars as the primary arsenal for German war machinery, the center of the “steel empires” of Krupp and Thyssen. Since the 1960s, the area has had to diversify, first toward manufacturing, then to the service and high-technology industries. The Ruhr has been a model for eradicating air and water pollution and is today the site of numerous artificial lakes, parks, and bike trails, integrated within the highly populated residential areas. The Zollverein Coal Mine Industrial Complex in Essen, for example, once the largest and most modern colliery in Europe, was converted from a decaying facility into a modern technology museum and a monument to industrial art. A side valley in the Ruhr region has also given its name to a major chapter in human prehistory, the Neanderthal.